Your credit report is a compilation of information about the way you handle your credit and debt accounts. It includes information about how much debt you've accumulated, how you pay your bills, where you live, where you work, whether you've filed bankruptcy or had a lawsuit judgment entered against you, and whether you've had a home foreclosed or vehicle repossessed. If it sounds like your credit report contains a lot of information, that's because it does. An annual credit report can be over 100 pages long. Credit reports are maintained by businesses known as credit bureaus or credit reporting agencies. In the United States, there are three major credit bureaus: Equifax, Experian, and TransUnion. Companies that you do business with have agreed to send your debt information to credit bureaus (at least one of them or maybe all three) who then update that information in your credit report. Most of your credit card and loan accounts are updated on your credit report monthly. Some businesses don't update your credit report with your monthly payments but will notify the credit bureaus when you become seriously delinquent on your payments. For example, your cable bill isn't automatically included in your credit report, but if you fall more than six months behind on your payments, the bill might be listed on your credit report as a debt collection. What Type of Information Is Included in Credit Reports? Credit reports include basic identifying information like your name, address, and place of employment. Misspellings of your name and previous addresses and employers may be listed on your credit report. Sometimes this is because of an error with the business who reported your information. Or, it could be a sign of identity theft. Your credit report contains detailed information about your credit cards and loans. For credit cards, your balance, credit limit, account type, account status, and payment history are all included on your credit report. Loan balances, original loan amount, and payment history appear on your credit report. Public records like bankruptcy, foreclosure, repossessions, and tax liens are listed in a separate section of your credit report. Credit reports include a list of businesses that have recently checked your credit history either as a result of an application you made or a promotional screening. These credit checks are known as inquiries. Your version of your credit report will show inquiries from everyone who's pulled your credit report, including businesses who look at your report for promotional purposes. A lender's version of your credit report only shows the inquiries that were made when you put in some type of application. You should order your credit report at least once a year to make sure the information listed on it is correct. If you suspect you've been a victim of identity theft, you should monitor your credit report more frequently. You might order your credit report more frequently than that if you're actively trying to repair your credit or if you expect to apply for a major loan soon. You can order your credit report in a few ways: for free through a website the government set up for that purpose, for free via a promotional offer, or by purchasing from one of the three credit bureaus. A variety of businesses check your credit report to make decisions about you. Banks check your credit report before approving you for credit cards and loans, including a mortgage or auto loan. Landlords review your credit report to decide whether to rent to you. Some employers check credit reports as part of the application process. Your credit report affects many parts of your life, so it's important that the information included is accurate and positive. 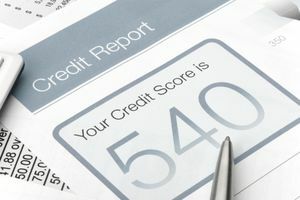 Your credit report is the sole source of information for your credit score, a number that lenders sometimes use instead of or in addition to your credit report. A credit score is a three-digit number that helps rate your credit report. High credit scores show that you have positive information on your credit report while low credit scores indicate the presence of negative information.